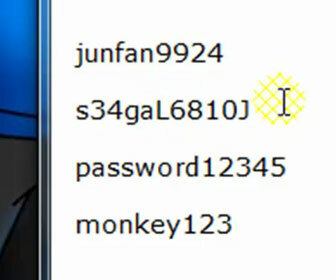 The 3rd Grade level passwords many people use drive me crazy. Some of these people that I know in person I consider to be bright. That’s part of what drives me crazy when it comes to people and their simplistic password creation. Their brightness level does not impact the complexity of their various account passwords. [adblockingdetector id=”1″]Last year the website RockYou.com had a major security breach, 32 million passwords were released. The #1 password on the site was “123456” followed by #2 “12345”#3 “123456789”, #4 “Password” and #5 “iloveyou”. You can see the rest of the top 20 most popular passwords used on the site RockYou.com here. Some people may be like me and have a bad memory. That is a reason why they use simplistic passwords since they can’t remember more complex ones. I thought of several methods I use to create passwords. I show you two of the methods in the video tutorial below. The first method in the video is meant for those of you that are very comfortable using “123456”, “password”, “iloveyou” or something similar and refuse to toughen it up. It may not be as secure as a password should be but it is a lot harder to figure out or crack than passwords like “123456”, “password” and “qwerty”. I highly recommend that people use the second method I show in the video to base their password on (or if you can think of something better that you have no problems memorizing all the power to you). [adblockingdetector id=”5″]NOTE: I forgot to mention one thing in the secure password creation video tutorial below. The longer a password is the harder it will be to crack. Use a password that has AT LEAST 7 characters. 9+ characters is optimum. This article goes into more detail about how longer passwords are harder to crack.